....You would probably say i was "dreamin"
Well this is the aim with Kagero's range of "miniTopcolor" books - and this is the second part of their Fw 190 series over europe called - you guessed it - "Mini Topcolors 38 - Fw 190s Over Europe Part 2" and it features exactly what i specified earlier. Well now we know the price - but Is it any good? Well for a start there isn't much reading to be had - at a paragraph for each of these aircraft in both Polish and English Dual text this is no history lesson. BUT the text is compelling even though it is short in length. The supplied text makes you want to know more on what is in front of you, and coupled with the artwork of each plane gets you enthused to try to research yourself a little more on the pilot and plane he flew. There are two decal sheets provided - printed by Cartograf of italy, they are a semi flat and thick - but - not -too thick set with strong whites and printed within register. Even the smallest of writing seems legible and the thing that impressed me the most was the reduction of carrier film. The only extra that can really be seen is between some of the larger scale numbers to hold them together. Having used Cartograf decals for my Fw 190 before i can say i removed even this extra film as they are able to be handled and are quite strong when going into position. You can see the absolute minimum of carrier film when you hold the decal against the light like we have here. 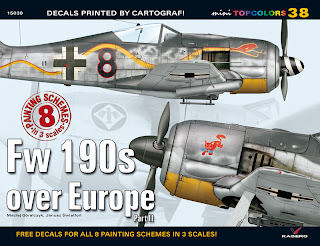 - Focke-Wulf Fw 190 A-9/R11; W.Nr. 206000, 'White 2' of III./KG(J) 27, Wels, Austria, spring 1945. I have to say i would be partial to the last scheme if i was making one. It is great to see a large variety of "Wurgers" here - from the early A-2's to the Rammjägers and later A-9's there is a large coverage of spectacular aircraft covered. The only thing missing in a book like this photographical evidence to back up the research - but there are only so many pages i suppose to fit it all in. Star for many of this book though will be the wrapped "snake" emblem on the Fw 190 A-8/R2; 'Red 10', flown by Ofw. Karl Rusack. Examples like this heavily camo'ed version below though get my pulse racing just as much. Well i have to say i think this is a wonderful - if short book. The profiles are just excellent and not too overdone. The authors really do know their stuff and have researched the book very well. Kagero has really turned the corner over the last few years and this book is further evidence to support this claim.